October 2001 - the first AtF. 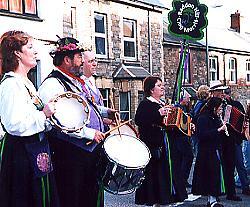 In the first place we have a long association, beginning in the mid 1960's, with Bampton Fair; especially the culture of singing, playing musical instruments and step dancing carried on by the gypsies and the local community. Fair Day is always marked on the calendar along with other annual musical landmarks at the beginning of the year. Add to this our association with musicians, singers and dancers from Ireland and Brittany through club coach trips, festivals and holidays. On the way firm friendships have been formed, tunes, songs and dancing styles exchanged, and a lot of laughter shared. 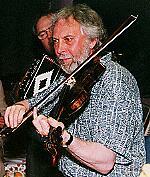 In 1997, on a club visit to Limerick, the suggestion of an Anglo Irish festival was made. The date chosen was the last weekend in October 1998; the place the village of Cheriton Fitzpaine. It was a great success and was followed by a return visit to Limerick. It soon became apparent that we would have to find somewhere larger if the festivals were to continue. By 2001 our Breton friends had joined in. Bampton was our chosen venue and since the last weekend of October followed the Fair "After the Fair" was the only real contender for a title! We applied for and received an "Awards for All" grant. 2001 was the year of the foot and mouth epidemic. Devon was just re-opening and the festival provided welcome light relief and some economic boost at the end of a difficult holiday season. Bampton's Twinning Association members opened their doors to the Breton visitors; streets, halls and pubs erupted to the sound of music; the guests were bowled over by the friendly welcome given them by Bampton residents; fun was had by all and everyone said "lets do it again." When Kelley Beeston became Fair Organiser she approached us and we instantly agreed that working together could only bring benefits for us all. In July 2005 we, and the Irish musicians, were invited to Elliant where we enjoyed a wonderful weekend of music and hospitality. This year we look forward to welcoming singers, musicians and dancers from England, Ireland and Brittany to provide entertainment on the streets, in the pubs, in concert hall and dance hall. We are confident that together with the people of Bampton we will again have a wonderful weekend! "After the Fair " is non profit making, and is financed by Pennymoor Singaround, Awards For All and Mid Devon District Council. Our overseas guests are financing their own fares, and are not being paid a fee. Collecting tins will be available for anyone who wishes to show their appreciation of the guests by making a contribution to their expenses. All those involved in the organisation of the festival are giving their services free. Look for information on this event and other Pennymoor Singaround events on our new web site - here.